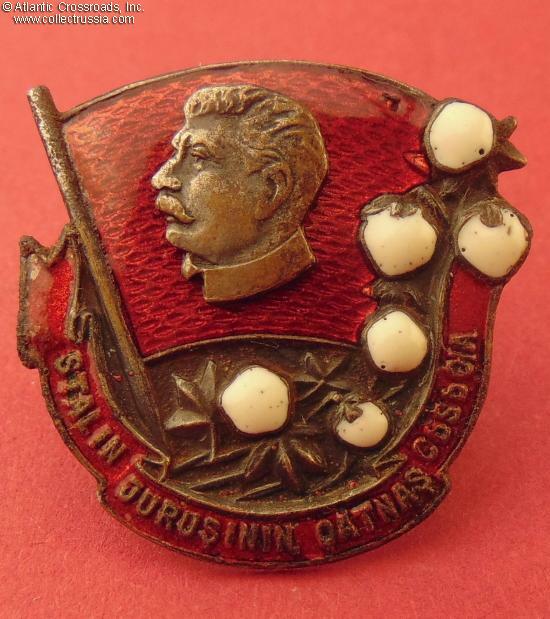 Badge of a Shock-Worker of Stalin Cotton Campaign, circa mid-1930s. Copper-plated and silver-plated steel, enamels; 29.8 x 31.0 mm. Two-piece construction, with superimposed Stalin's bust. Issued in Uzbekistan, hence the Uzbek writing on the bottom plaque. 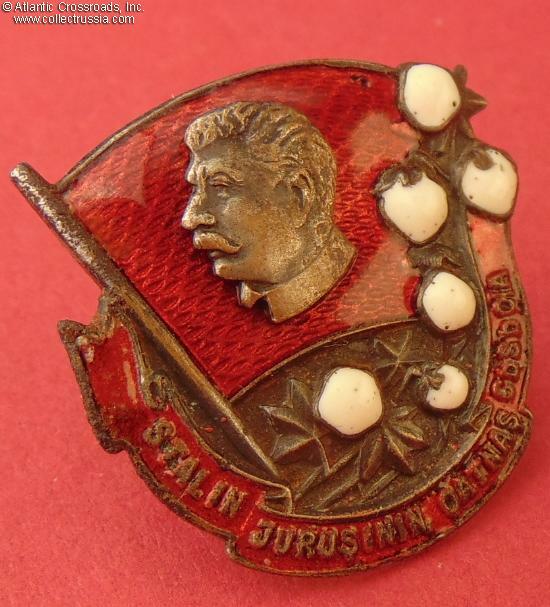 In excellent condition, extraordinary for this badge. 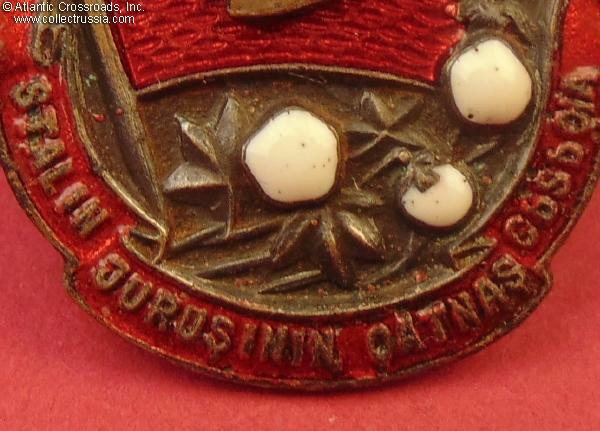 The red enamel on both the banner and scroll shows magnificent luster and is essentially pristine; there is a tiny imperfection in the upper left corner of the banner, but it appears to be a flaw that occurred during the manufacturing process rather than a chip acquired at a later time. 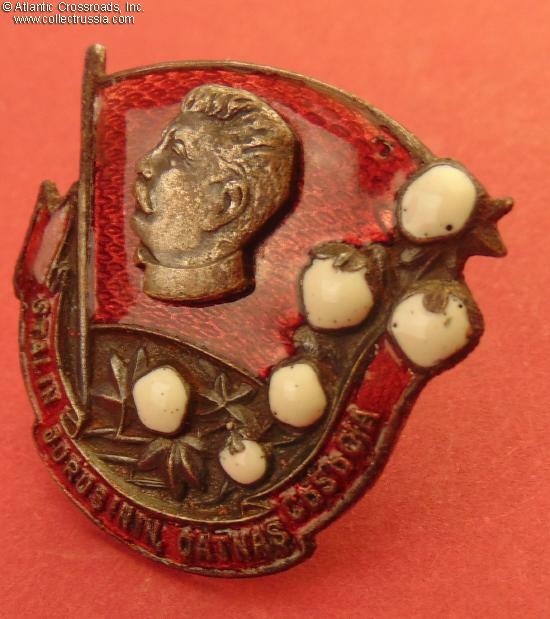 The white cotton blossoms are likewise perfect having only some imbedded manufacturing imperfections that are typical for the badge. 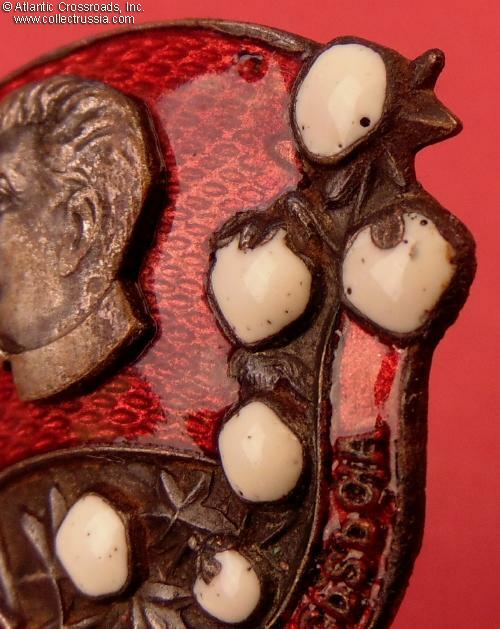 Both the red and white enamels are completely free of flaking, hairlines or rubbing - an extremely unusual case! 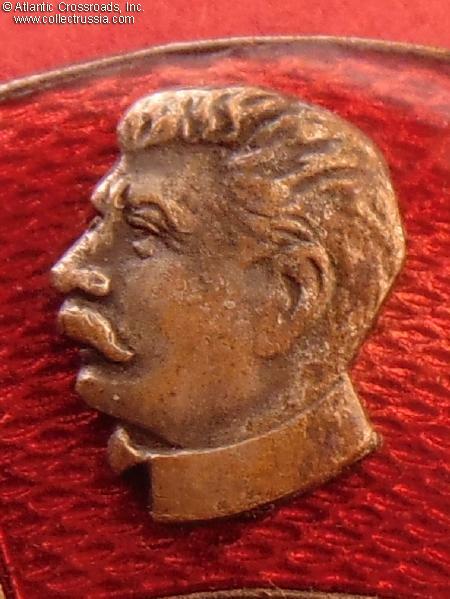 Details of the Stalin's bas-relief portrait and foliage are extremely crisp. 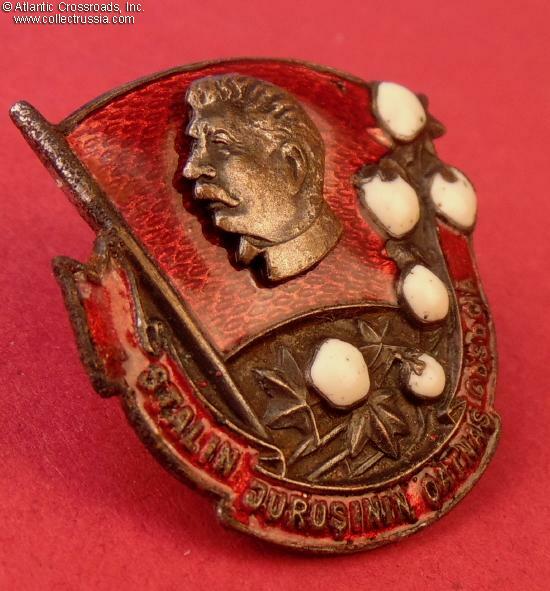 The original silver finish in the lower part of the badge is perfect while on the Stalin's portrait it shows only tiny amount of wear, with most of the silver still present. 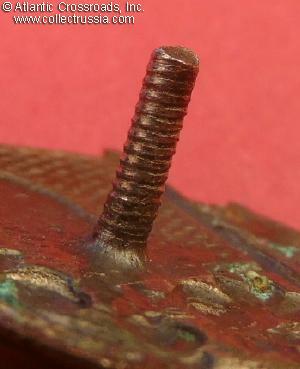 The screw post is full length, nearly 10 mm long. 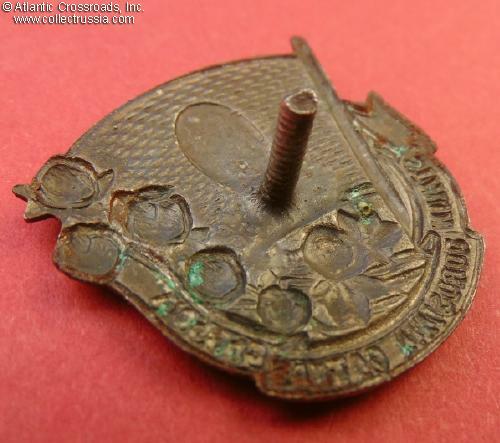 Comes with original screw plate maker-marked "Fabmasi Factory, Lenoblsobes (Leningrad Department of Social Care.)" /See "Avers 8", p. 87, fig. 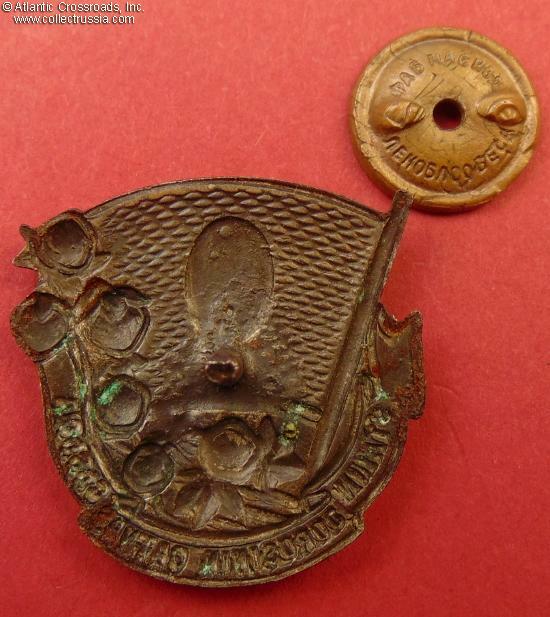 493 and "Breast Badges of the USSR of the Era of Labor Victories, 1920-1940", p. 121, fig. 176/.